We recently returned home from a trip to visit my folks in South Carolina. While I've never lived in S.C., my parents and brother have for about 20 years. We don't get to visit nearly often as we'd like, especially over the last couple of years with the economy limiting our travel quite a bit. The kids and I finally were able to head for a visit last week. The rural area my folks live in is always a change of pace for my fast-moving kids. For starters, the only internet available in their home is dial-up! (Ok, that impacted me more than the kids!). They live in a log cabin home on 50 acres of wooded property with the Blue Ridge Mountains visible from the yard. Grandma and Grandpa’s house is filled with lots of interesting critters, both in and out. The kids enjoyed playing with their three dogs, but they also visited with the two (domestic) rabbits, not to mention the lizards that are not common to our neck of the woods. Thankfully there were no scorpions or bats on this visit! My mom is also a fairly new beekeeper and they watched her collect honey one day. Aside from the critters, there is just a lot of interesting “stuff”. Though I sometimes worry that my parents will one day appear on the show Hoarders, I have to admit that the décor in and around the house is quite interesting. It is impossible to take it all in at once. My mom is particularly a fan of the old and unusual. My daughter decided to borrow my camera one slow afternoon and “pretend to be creative” while she browsed Grandma’s things. Some of Grandma’s “stuff” actually provided some entertainment, too! After looking at a strange contraption in the guest bedroom for several days, my son finally asked my mom what it was. To imagine that this was the iPod of the olden days! If you use your imagination, you’ll see how the park got its name. Do you see Caesar in the side of the mountain? It looks like he needs to shave his beard of greenery. A favorite part of this park is the Devil’s Kitchen. It isn’t for the claustrophobic, but it does provide a nice shady spot away from the summer heat. Given that, I don't know how it got its name! Another interesting site we visited was a small vacant lot in the middle of a residential area that my dad recently acquired in a tax auction. After his purchase, the county informed him that there is a slave cemetery located on the property. You would have never known if you weren’t told, but sure enough there is a small wooded section, about 50’ x 30’ that has plain upturned stones as markers throughout. Some of the stones were smaller than the others, and we wondered if these might mark the graves of children. Unfortunately, I didn't have a camera on me. Visiting it brought up emotions of sadness. My folks were thinking of contacting a historical society to see if they might be interested in the property. And lastly, the night before we returned, we were treated to a local theater performance of Shenandoah. My theater-loving kid especially enjoyed this. We definitely had a very enjoyable visit and it reminded me that we need to do so more often. My kids talk on the phone to my folks quite a bit and they see them once or twice a year when they come to visit us when traveling this way. But, it isn’t quite the same as going to visit Grandma and Grandpa on their turf. Hopefully we won't have to wait so long before our next visit. I'm always blogging in my head, with very good intentions of actually sharing here, but in reality it doesn't always play out that way. Here is a list of titles of all those posts I *wanted* to write since the start of summer, but never made it to the keyboard. I hope to expand on some of these in the future, rather than just think them! I've been happy to see an increase in the production of family movies with a strong message over the last few years. There is entirely too much garbage out there for viewing and not enough quality films for the whole family. I had the recent opportunity to review THE GRACE CARD, which was released on DVD on August 16th. THE GRACE CARD is the first movie from Memphis-based Graceworks Pictures in conjunction with Calvary Pictures. The story line of this movie had a wonderful themes of forgiveness, redemption, and grace that were portrayed in ways that are very relevant to our culture today. It is rated PG-13 and does have some mature themes (drug use, violence, racism, death, bitterness), but still very appropriate for family viewing. The topics also leave plenty of room for discussion afterward. If you go to THE GRACE CARD website, you will also find ministry resources to use with a church study or Sunday school class. It is unfortunate that movies like THE GRACE CARD often lack in budget, which is all the more reason to continue to support them. They certainly make up for it with solid Christian themes for family movie viewing. Congrats to #75, c allen!!! I have a copy of THE GRACE CARD to give to one lucky reader! See below for how you can enter. Please make sure to leave a way for me to contact you should you be the winner. Just leave me a comment! Simple! Like The Grace Card on Facebook. The giveaway will end on Sept 2nd at 6 p.m. EST and will be chosen by a random number generator. Disclosure of Material Connection: I received one or more of the products or services mentioned above for free in the hope that I would mention it on my blog. Regardless, I only recommend products or services I use personally and believe will be good for my readers. I am disclosing this in accordance with the Federal Trade Commission’s 16 CFR, Part 255: Guides Concerning the Use of Endorsements and Testimonials in Advertising. A couple of years ago I had the opportunity to review a Bible study, titled Old Testament Overview, from Grapevine Studies. You can read that review here. 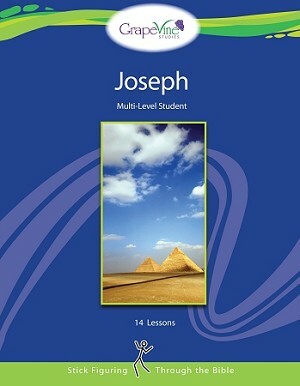 Now, my readers have the opportunity to receive a copy of a new study on the life of Joseph. This title, for ages 7 and up, was just released. Congrats to Lynne@TDHGP, who posted the 34th comment. An email is on the way! I am giving away an e-book copy of the student and teacher e-book, which retail for a total of $28.90. There are several ways to enter. Be sure to leave a way for me to contact you should you be the winner. Like Grapevine Studies on Facebook. The giveaway will end on August 12th at 6 p.m. EST and will be chosen by a random number generator. If you'd like to purchase this title, which is currently on sale, you may do so at the Grapevine Studies website. While you are there, check out some of the other studies that will have your students "stick figuring through the Bible"! Use coupon code BLOG55 for 20% off of non-sale items!